Orion is the gift that keeps on giving. When you look toward that constellation in the sky, you’re facing a region of massive ongoing star formation. A sprawling cloud of gas and dust occupies Orion’s midsection, most of it thick and opaque. Some of it is illuminated by stars embedded inside, and some by the reflected light of nearby stars. This is actually a combination of two views: one in visible light from the Digitized Sky Survey, and the other from the APEX telescope, which can see light in the submillimeter wavelength range — 1000 times the wavelength the human eye can see. Only cold, cold objects emit at this wavelength, things a few degrees above absolute zero. The blue material in the image is gas and dust reflecting starlight from nearby blue stars, so it can be seen in visible light. The cold dust, though, threads in front and behind the visible material, and can only be seen by APEX’s eye, tuned as it is to the far infrared. 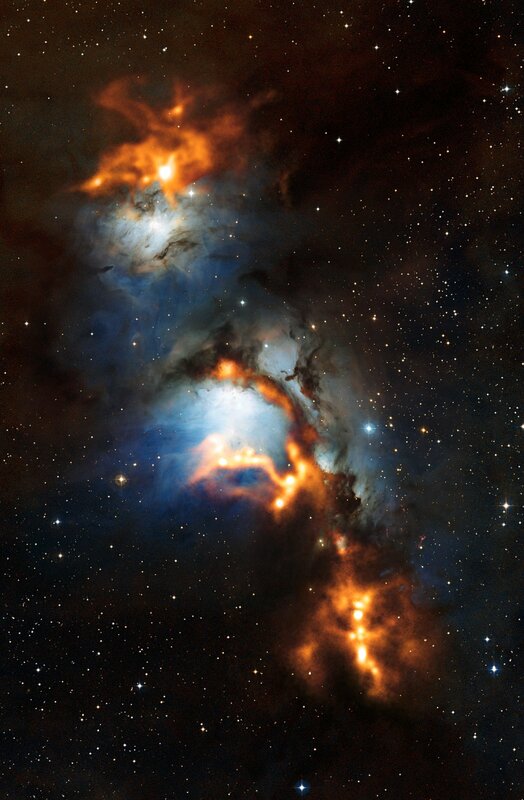 Falsely colored in this image, it glows an eerie orange like fire running through cracks in the nebula. The inset image here is from my friend Travis Rector. It covers roughly the top 2/3 of the picture above, but shows only the light that we can see with our eyes. You can see that where the cold dust glows in the APEX image, it appears dark here. Thick cold dust absorbs visible light, so it appears dark to our eyes. In astronomy, what looks bright and what looks dark depends very strongly on how you look at it. But there’s more to this story, too. That thick dust is actually shrouding a nursery! Buried deep in that cocoon are stars that are forming — you can see them as bright knots in the orange APEX image. M78 is known to house quite a few young stars, several dozen, some only a few million years old. Using just visible light telescopes we’d only see those stars that are out in the open, while the others swaddled in that blanket of dust would remain invisible. Using APEX, they pop out like embers in a dark fireplace. It’s always fun to be reminded that we see only a narrow, narrow slice of the Universe with our eyes. But we’ve extended our vision across the spectrum, enhancing and expanding our view. The Universe glows fiercely everywhere we look, and places we once thought dark are actually ablaze with new light.